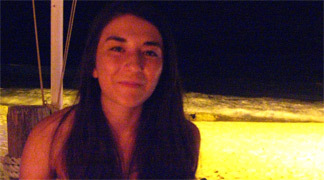 Update: The Picture Anguilla! photo contest winner has been announced! What Do You See When You Picture Anguilla? A photo may be worth a thousand words, but Anguilla photos can be worth so much more, capturing memorable moments, yours forever, ready to re-live whenever you like. One glance at a special photo, even years later, can bring back warm emotions of togetherness with family or sheer relaxation away from day-to-day stress or reward you with the pleasure of breathtaking scenery. Share your favorite Anguilla photo along with a brief note about why it is so special. The Prize? Win a $3,000 Week in Anguilla! Summer (June 1-Aug 15) The beaches are peaceful, the water is warm, the restaurants are open and quiet. The whole island "cools down" as the weather "heats up." 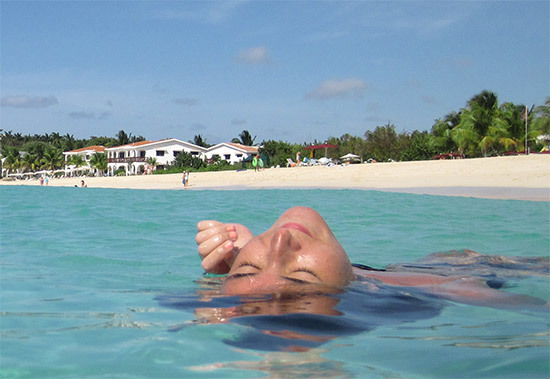 Read about Anguilla weather in August. If you are looking for more of an action-packed holiday, there is a spike in activity in August for Carnival! Read about Anguilla Carnival here. Pre-Winter (November 1 - December 18) Restaurants and hotels have re-opened, but the island is still un-touristed and tranquil. While the weather turns miserable up North, it's absolutely perfect in Anguilla. A great pre-winter escape! Traveling to Anguilla in "the off season" is truly one of the best kept Caribbean secrets. And now you can enjoy Anguilla at its quiet best, free! Carimar Beach Club. Relax for 6 nights/7 days right on the sandy beach of magnificent Meads Bay. These 6 nights even include taxes, service fees and surcharges! 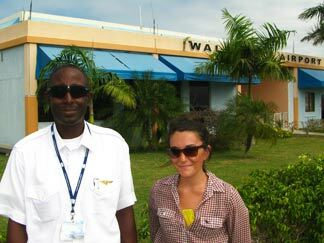 Anguilla Air Services. Connecting airfare for 2, the coolest way to get to or from St. Maarten. Carimar Beach Club is situated right on Meads Bay, one of Anguilla's most magnificent beaches. Carimar delivers high-value accommodations on a beach known for its gleaming white sand and rhythmic rolling waves. Carimar has an intensely devoted following. Now, you get to fall captive to its charms. Wake up to a glistening beach and the turquoise of Meads Bay. Enjoy flawless Caribbean sunsets. And fall asleep to the sounds of surf. Each restaurant has been carefully chosen to provide you with a superb beach-and-dine experience. With the exception of Tasty's, a local 5-star favorite which is inland, each serves lunch and dinner and provides beachside chaises and umbrellas. You, could, literally, make a day out of each restauarant experience. The Zen/Caribbean architecture, created by David and Vida Lloyd, with Vida's husband Clyde, is one of the "must-eat-at" experiences in Angilla. 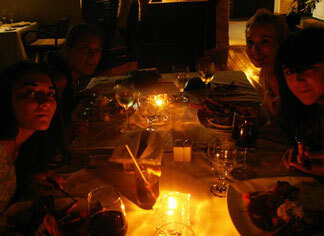 I don't think we'll ever forget our first meal at the sensational da'Vida restaurant. We had wondered for months what was being built on gorgeous Crocus Bay Beach. And I do mean right on the beach. Our appetizers were Thai fish cake and curried chicken dumplings. Dinner included Angus Beef Tenderloin and Katouche Crayfish Tails. My Dad swears their Angus Beef Tenderloin is the best steak on the island. Sunset tapas are not to be missed. If you like, start with the tapas on the "bar side" and then move over to the "restaurant side" for the rest of dinner! Even before it relocated to Meads Bay, Straw Hat has been one of our top favorites for more than 10 years. 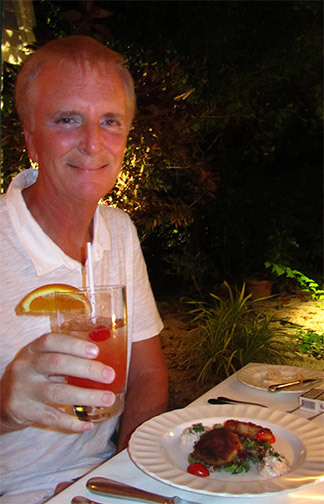 Peter Parles and his wife, Anne, are delightful hosts and have built what has become another "Anguilla must-dine." Honestly, though, you can't go wrong with anything on the menu. We always leave Straw Hat totally satiated. Also on Meads Bay, Bob and Melinda Blanchard's (authors of the nationally-recognized A Trip to the Beach), Blanchards Restaurant. Bob and Melinda are a unique couple, with tremendous warmth and passion for their restaurant, Anguilla, and life in general. The setting is picturesque, the restaurant exuding a certain classic Caribbean charm that puts you right at ease. Roasted mussels, lobster & shrimp cakes served with a tomato tartar sauce, a Caribbean sampler that includes a taste of Mahi Mahi, Crayfish and Jerk Chicken. Dessert is not to be missed here! The cracked coconut and warm bread pudding make the perfect end to the evening. This ever-elegant Anguilla restaurant on Barnes Bay is the true definition of a seaside grill. Right on the sea's edge, the restaurant's wooden deck is just slightly elevated from the beach's sandy shores. You can nearly reach out and touch the waves. Mango's ambience magically mixes sophisticated finess and laid-back "beachshack." The restaurant boasts a classic menu with many Anguillian favorites such as grilled whole snapper and Anguillian lobster. Mixed in are more "creative" items such as chicken breast stuffed with monterey jack cheese, sun dried tomato and basil, and shrimp provencal. All is cooked to perfection. Graced with friendly and efficient staff and a genuinely warm and friendly owner (Dave Coburn), Mango's is one of the island's top fine dining options. It is one of my Dad's personal favorites. This "institution" is known for its Anguilla cuisine cooked up by famed head chef and owner Dale Carty. 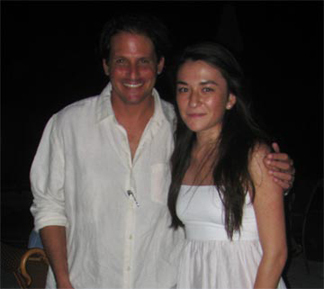 Raised in Anguilla, Dale cooks with wide knowledge of and experience with Caribbean flavors and natural ingredients. His skills were sharpened as he worked under the Master French Chefs Michel and Jo Rostang. The Warm Goat Cheese Salad and Black Bean Soup are two starters you can't go wrong with. For the main course, the Grilled Tuna Steak, Coconut Crusted Parrotfish and the pastas always get rave reviews. Tasty's also serves a very tasty breakfast and lunch. Palm Grove is our "oldest" favorite, Nat Richardson (and family) our oldest friends. 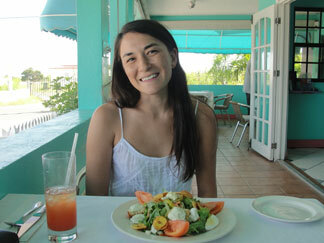 Nat's is the first Anguilla restaurant that we fell in love with. Nat serves up ribs and chicken, and crayfish and lobster so fresh they are still moving when he takes your order. 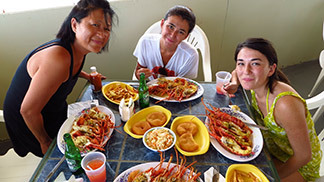 The crayfish are near lobster size, and absolutely delicious. We always go for a late crayfish lunch (they are not open for supper). Nat and his son Theon tirelessly work on perfecting the blend of juices for the crayfish sauce. Served with fresh, hot Johnny cakes and hand-cut steak fries, this is one of the very best meals on the island, and something that is quintessentially Anguilla! For most visitors, the best way to fly to Anguilla is actually to fly to St. Maarten (SXM). Its Princess Juliana Airport receives non-stops from Europe and many American cities. Totally avoid Immigration at St. Maarten and enjoy the 1,000 foot view of St. Maarten and Anguilla as you gently touch down in Anguilla. A few minutes later, you're through Anguilla Immigration (always quiet here) and on your way to your hotel. Flying to Anguilla is not only the most convenient way to get to/from Anguilla, but it is the coolest too. There is a certain sense of adventure going up and then coming down in this 8 seater Britten Norman Islander. Carimar Beach Club's offer is valid July 18-August 31 and November 1-December 18. How to Win Picture Anguilla! First, all entries are pre-screened. Only special photos with captivating descriptions have been published. Second, get votes and comments for your photos. To boost your chances of winning, be sure to encourage your friends and family to vote for and comment on your photo(s). Decision of judges is binding and final. Note: While you are encouraged to promote your photo(s), please do not spam. It may result in disqualification. Photo Entry Period: Now closed (closed July 8th at 6PM). 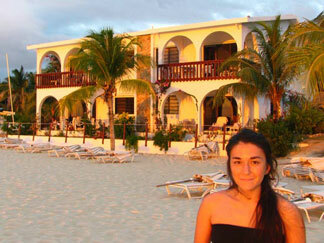 Update: The Picture Anguilla winner has been chosen! I will make announcements on the contest through my Anguilla Blog and my Anguilla Beach Lovers newsletter, so be sure to follow the blog and sign up for my newsletter. Note: This is especially important because Facebook restricts the number of contest announcements we can make within Facebook. Click here to return to Anguilla-Beaches.com's Facebook page to enter Picture Anguilla!